Dinner was a little bit spontaneous, as the place we had originally planned to visit had stopped serving food so we found ourselves at a Thai restaurant instead. The decor was gorgeous, lots of rich wood and gold Thai statues. We were seated in this cosy little booth area that was a little secluded from the rest of the restaurant. 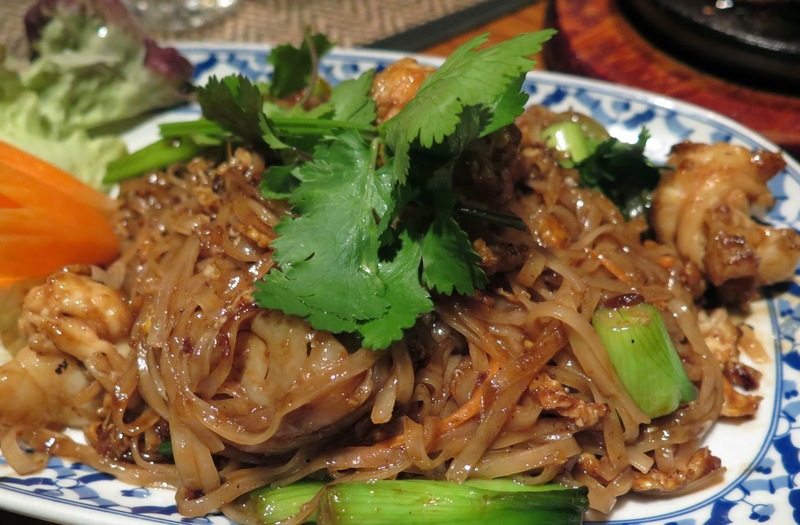 Rather than feeling like we were in the middle of an English town, the surroundings transported us to a decadent Thai destination. 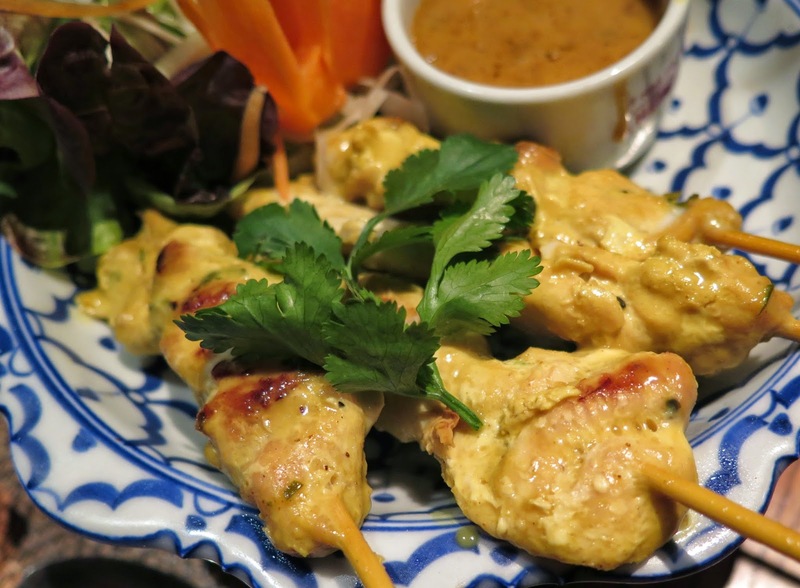 We chose chicken satay to start because it is a favourite of ours and then a couple of mains to share. 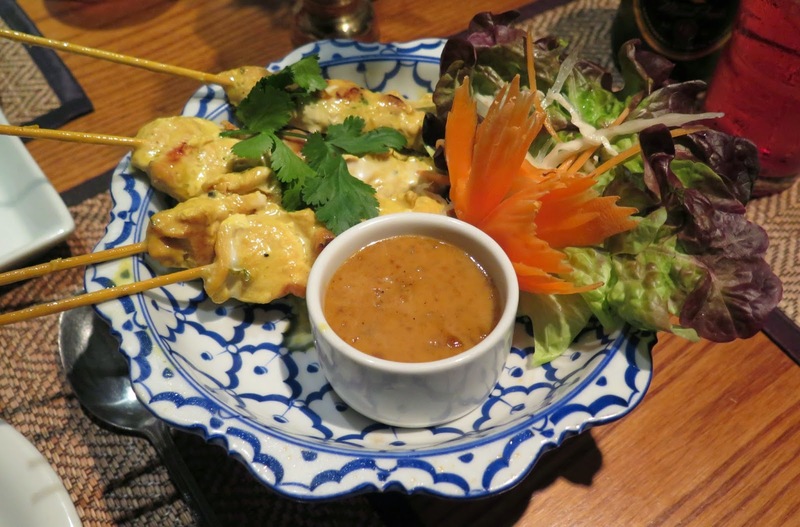 The satay was absolutely delicious, the chicken was tender and juicy and the peanut sauce was creamy and moreish, and it came beautifully presented. 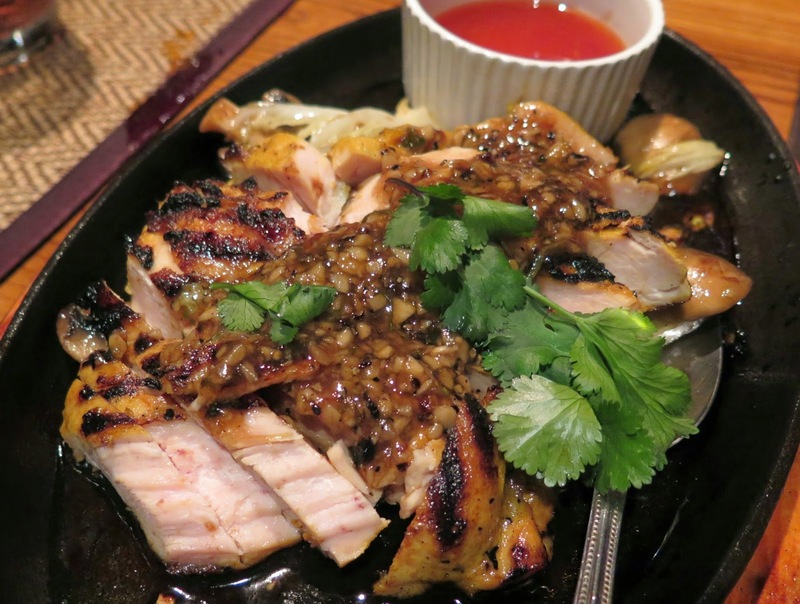 The Gai Yang was outstanding, char grilled chicken that had been marinated in garlic, coconut milk, coriander root and rice wine. 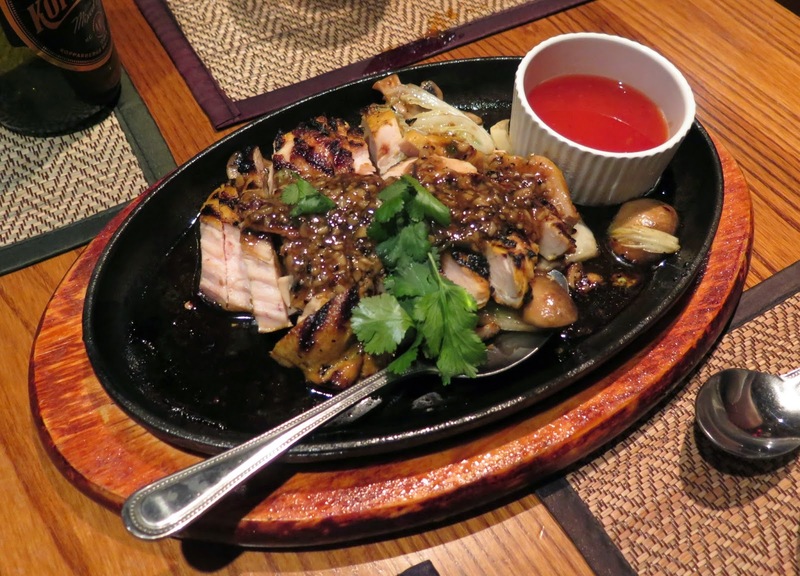 It was certainly garlicky but I love that, and the char grilled flavour really came through on the meat. 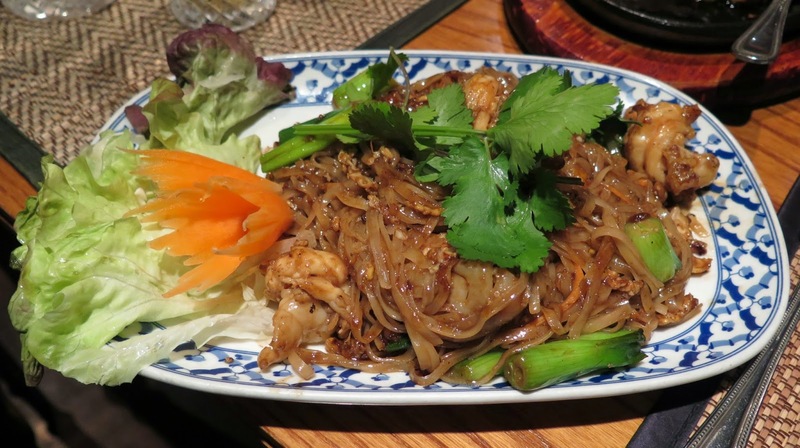 We also ordered a prawn pad thai, this is one of my favourite Thai dishes and although Siam Cottages version was tasty I felt the prawns were a little over cooked. However good the food was, it was tainted by the terrible service we received. We waited an hour for our main course to arrive, without any explanation of the delay. When the first of our mains did finally turn up, we waited a further five minutes for the other to arrive. We decided to start eating despite our coconut rice having not shown up but after 15 minutes we informed the waitress and she scurried off to find out where it was. She returned to tell us that the batch of coconut rice wasn't ready! By this point we had been waiting for an hour and twenty minutes! How long does rice take to cook?? The thing that annoyed me about this was that if my boyfriend and I hadn't been sharing, then one of us would have been served a chicken dish without anything to go with it, and they wouldn't have even bothered to give us an explanation had we not asked!! It's such a shame that their service is so poor, we noticed that other people in the restaurant that evening were having the same issues. Disappointing, I very much doubt we will ever return as my boyfriend was seething, and it wasn't an enjoyable dining experience. Sorry Siam Cottage, you leave a lot to be desired, and from the reviews on trip advisor we are clearly not the only ones who think so! It's too bad about the poor service. =( Maybe they were understaffed that night? What is your opinion on tipping when the service is terrible? I'd still tip, but I probably wouldn't go back to the restaurant. Thank you! From the reviews I have seen they always seem a little under staffed. We definitly did not leave a tip! A tip should be earned for doing a good job, not just for doing the minimum to get by!